Is every Canadian medical school graduate entitled to become a practicing physician? If you’re reading beyond the title of this article, it is likely that you either believe this is already the case, or have a fairly strong opinion on the subject. In fact, I’ve come to learn that many Canadians, including medical school applicants and their families, believe that entry to medical school is the final major barrier to a career in medicine. In the interest of ensuring a common starting point to this discussion, let’s clarify that a medical school degree does not entitle anyone to practice medicine in Canada. Graduates must also undertake and successfully complete a residency program. There are about 30 such programs available to graduates, all considered postgraduate programs within the same universities that house our medical schools, and all leading to qualification by either the Canadian College of Family Physicians or Royal College of Physicians and Surgeons. Resident physicians, unlike medical students, are salaried during their training, which can last up to 7 years. The funding is provided by provincial governments, that therefore control the number and specialty distribution of postgraduate residency positions. In doing so, the number of medical school graduates is certainly known and considered, but the perceived societal need for physicians, both in terms of absolute numbers and specialty mix, is also a major determinant. The various ministries utilize complex but intrinsically imprecise methods to estimate those needs. Each year, about 2900 students graduate from our 17 Canadian medical schools. There are a total of about 3300 postgraduate training positions available across Canada in all entry disciplines. In theory, there should be space available for all graduates. However, the specialty distribution of those positions does not match the career interests of the graduates. In fact, far from it. Some disciplines have many more applicants than available positions and are therefore highly competitive. Others that often fail to fill their positions. In addition, about 700 postgraduate positions are in exclusively French language environments and therefore not practically available to all graduates. Finally, each year about 2500 Canadian citizens or landed immigrants who graduated from schools outside Canada also apply for residency training positions. Although the number of positions for which they are eligible is restricted and controlled, they further reduce the availability of positions for Canadian medical school grads. The net result of all this is that a steadily increasing number of Canadian med school grads are failing to find residency positions each year. This year, that number was 68, up from 46 in 2016 and 39 in 2015. Depending on your particular perspective on this issue, those numbers may seem either insignificant or a major concern. It is certainly true that the vast majority (over 97%) of Canadian graduates find residencies although not necessarily in specialties or locations of their choice. That is far more than occurs in virtually any other area of study or any other professional school, and may be seen as a reasonable concession in order to balance personal preferences against the societal need to have the right number of the right type of physicians in the right places, at least as assessed by those elected or appointed to protect the public interest. Medical education, after all, is not a right but a privilege, and a lucrative privilege at that. It is highly subsidized through the public purse, to the tune of an estimated half million dollars per physician in public funding. This is beyond the costs incurred by students themselves. It could also be rationally argued that an undergraduate medical education could serve as an excellent preparation for a variety of alternate careers, such as research, health system administration or medical technology. Whatever your personal perspective, there are a number of consequences of this increasing phenomenon of “unmatched” graduates that must be considered. The sizable societal investment in medical education noted above is clearly intended to result in a productive physician engaging the health concerns of citizens. Anything else is a misappropriation of resources. The increasingly competitive environment for postgraduate positions is, understandably, becoming an increasing focus of attention to students. This influences how they engage all aspects of their curriculum and compromises what should be a time devoted only to learning and skill development. It also threatens the sense of collegiality and collaboration so important to a physician’s professional development and wellness. Undergraduate medical education is designed and structured with the intention of producing practicing physicians. It is seen as a continuum of training that leads seamlessly to practice readiness. The academic and professional expectations of students are based on this assumption. If significant numbers of students do not progress in their training, that concept and educational approach will no longer be justified. Can or should such high standards be maintained if significant numbers of students are expected to consider alternative careers? Students undertake considerable personal debt in supporting their medical education. The average debt in Canada is approaching $100,000, but ranges to over $250,000. This debt is supported largely by bank loans, provided on the assumption that the student will engage a career that will allow them to repay. Failure to engage postgraduate training can therefore trigger a need to repay a large loan with no means to do so. Failure to find residency training can therefore be a financial as well as personal disaster for these promising young people as they attempt to begin their careers. If the ability to obtain loans become more constrained, the already acknowledged socioeconomic barriers to medical education and careers may increase, affecting already underrepresented populations. Finally, there is a huge personal cost to bear for those who go unmatched. These young people, who entered the study of medicine with understandably high hopes and aspirations, are forced to face rather bitter disappointment and self-doubt, often for circumstances that neither they nor those who advise them fully understand. That reality has been evident to those of us involved in medical education for many years. Recently, this situation has taken on a public face, thanks to the willingness of the family of Robert Chu to share their personal loss. Robert took his own life in September of 2016, after two unsuccessful attempts to obtain a residency position. We cannot presume Robert’s motives for his actions, nor can this tragedy be laid at the feet of any individual or institution. However, it would be equally wrong to dismiss Robert as an inevitable casualty of a flawed system. At the very least, he personalizes and therefore crystallizes this issue for us and we should not dismiss the opportunity he and his family provide to engage this issue. And so, we return to the initial question posed in the title of this article. Are we willing to make a commitment to our students and ensure that they have the opportunity to complete the medical training they have begun, at considerable personal sacrifice? If so, then major structural changes in the postgraduate entry process will be required, involving either expansion or sequestering of entry positions for unmatched students. Such changes are far beyond what undergraduate medical programs can achieve on their own. To not make such a commitment is a de facto acceptance of the status quo, since it is clear that the current circumstances will continue and the number of unmatched students will therefore increase. In that event, we should, at a minimum, be fully honest and transparent with our students and applicants, clarifying that admission to medical school provides no assurance of eventual entry to medical practice. We should also alter our curricular objectives and content to ensure students are prepared for alternative careers. With no clear linkage to residency and eventual practice, clinical and professional components of undergraduate education will eventually be de-emphasized and deferred to postgraduate years, likely prolonging overall training. And so, it must be asked: When does professional training for medicine begin? At present, the presumption is that it begins at entry to an MD program. A growing number of unmatched students changes that paradigm and, with it, the pedagogical basis on which those programs are established. The consequences extend beyond the interests of the students themselves, although they would be reason enough. 34 thoughts on "Is every Canadian medical school graduate entitled to become a practicing physician?" Somewhere he was led or began to believe his degree was useless without residency, which assuredly it’s not. Myriad options are available to MDs who don’t go into residency immediately. I don’t think any blame is to be placed on any person or programme, though perhaps seminars on alternate routes & guest speakers who didn’t do residency at first should be provided. What happened with others who didn’t immediately match? What was their experience? Tragic situation; I wonder how well this generation of learners are prepared for adversity or “failure” – definitely an opportunity for educators to augment students’ preparation for everything not going right. Robert Chu did not fail anything. He was a terrific student. A flawed matching system failed him. The system needs to be fixed so that this doesn’t happen again. Robert Chu didn’t fail CaRMS. I think it’s important to clarify that CaRMS is a matching service, nothing more. It does not set the number or distribution of training positions, and makes no admission decisions. CaRMS did not fail, and is in no way responsible for this situation. I am skeptical that anything will change. CaRMS is “stable” and apparently that’s the ideal. Stability. The unmatched apparently deserve it, the morons they are. Off with them to other alternative careers! If schools were looking out for their students’ best interests they would encourage them to prepare an application to the USA concurrently with Canada. Things are only going to get worse. I don’t think anyone applies to and gets accepted into medical school with their goal being other than to practice medicine some day. Pre-application readiness, the application process, and the MD curriculum all support and demand this primary motivation. This is as it should be. The residency matching system is our best effort, adapted over the years, to place productive physicians into the health care system. It’s not perfect but as you point out it is using imprecise inputs, and has shifting desired outcomes each year. You suggest an expansion of the residency programs as an improvement, to reduce the number of unmatched graduates. But it seems to me that the number of residency positions is the fixed variable (fixed more by funding constraints than by societal need). An alternative solution is to reduce the number of unmatched graduates by a) a small reduction in the number of entering undergraduates each year, structured so individual schools would have a 5% leeway (from program capacity) each year without losing funding; and b) requiring that all graduates from Canadian schools be placed first, before international school graduates can be considered. My view is that all citizens who gain acceptance to medical school should be considered part of the profession, become members of the regulatory college (as are residents) since they are engaged from the beginning in interactions with the public, and, if successful in the MD program, move seamlessly into a Canadian residency position, albeit with no guarantee of discipline or site. In digressing, I would also suggest that Canadian medical students should be provided full coverage interest free loans with income contingent repayment systems stretched over their career. In my ideal world, this latter policy would be government sponsored from the physician services budget – lose a few pennies on each dollar earned later but never incur debt as a meds student. That might have a productive effect on career choice and in-program equanimity. Perhaps you could lobby all medical school deans to accept their responsibilities to the student they picked, trained, and awarded a useless degree without a residency to guarantee a residency in something at the next match. Curious: is a 2-3% unmatched rate high enough to justify a shift in curricular obligations? The idea that 100% of graduates should find residency spots implies that the process of selecting undergraduate medical students, as well as the training programs they enter, are flawlessly run and executed. Might we not accept that we do, at times, make mistakes*? The public interest (to which medical education is presumably beholden) is likely better served by a competitive medical residency training process, one that may recognize that the best 3% of foreign trained medical students are better than the worst 3% of domestic ones. We accept much higher failure rates in other professional licensure programs (law, engineering, related healthcare fields such as nursing), not to mention the job market as a whole. Why should medicine be different? *Note that I mean this in the abstract; not with respect to the unfortunate loss of Robert Chu and the tragedy his family faces. While I agree with you that a match process that selects the “best 3%” of foreign medical graduates over the “worst 3%” of domestic graduates would benefit the public interest (we definitely want great doctors! ), I do not think that the current selection process comes close to doing that. I think it is difficult to determine from a CV, a personal statement, and an interview who the “worst” clinicians will be. I certainly do not believe that the 68 unmatched CMGs from this year can be classified as the “worst 3%” of domestic students. This is why the CaRMS system is a failure. Those that don’t match are automatically assumed to be the “bottom 3%”, and thus deserve their fates. How can one tell who is part of the worst? There are no grades. There is no objective clinical evaluation. The Americans at least have the USMLE exams that objectively measure knowledge and can be used to stratify students. What do we have? Students who don’t to electives at schools where the programs are competitive are far less likely to get an interview. Elective schedules differ between schools. If a student, otherwise good, can’t get an elective at a particular program and thus is not interviewed there, does that make the student one of the “bottom 3%” if they fail to match? As a previously unmatched candidate, I do believe a large factor in failure to match during subsequent cycles is the stigma attached to not matching. For the vast majority of us, there is no clear indicator as to why we didn’t match. Maybe someone was too nervous during an interview, had electives that didn’t match up (god forbid someone has a change of heart in their career goals), or a lukewarm reference letter. It doesn’t matter because no one tells us what it was. No interviewer and no program director. Especially for large programs such as family medicine. We essentially go into the second Carms cycle blind, relying on the feedback, support and goodwill of our schools administration. Even so, programs will blacklist previously unmatched candidates and not even offer them an interview. I’ve seen people who “backed up” with family feign their way through Carms and match to the same program that didn’t even bother interviewing me, someone who actually is passionate about the specialty, simply because I was previously unmatched. This needs to change. I’m not saying my application was perfect and got rejected. I’m just saying it was not much different from any other application that did match and yet I was treated like a pariah. Anyway, I’m glad people are finally talking about this issue even if it did take a profound tragedy for it to happen. This is a pretty serious condemnation of the matching system. My background is not in healthcare or education, but rather in the aviation sector. In my world we would call what you are describing to be systemic failure. I would, too. The system isn’t bad. In fact, it’s the best we’ve had in a while. It works for the vast majority of the time. The problem is that in the 1-2% cases where it doesn’t, the consequences are pretty devastating and the system has no design to deal with them. I’m sure that’s something else you can appreciate in aviation. This is the biggest problem, and it happened to me too. Somewhere along the line not matching came to be seen as a failure and unworthiness of the person. The first comment on this page talks about how the “new generation” can’t deal with “failure”, as if not matching is failure and unworthiness. I am saddened that the consensus among most doctors is to accept the flawed matching system as if it is the best system we have. In a competitive field like medicine, now that we don’t have grades, we must use something as the yardstick, and that something is CaRMS. If you fail it once, you’re out. You’re garbage. You’re a shameful brainless failure. You’re relegated to settling for a career you probably don’t want. There’s no avenue to improve your application and try again. Not that you could improve it since nobody tells you why you weren’t “good enough”. You just don’t fit. I still take my failure to match personally, as if it is something wrong with my personality, since everyone I have spoken to about it was surprised and couldn’t offer much feedback except that my elective schedule wasn’t ideal. I couldn’t book enough electives in my desired specialty, and my school didn’t have a residency program in it. That’s the reason people tell me I had to settle for a career I didn’t, and still don’t, want. I completed a residency in a field that I have not one iota of interest in, but feign it enough to keep a job, and work as few hours as I possibly can. I feel as if I’ve wasted the last decade of my life. Had the match not been the permanent roadblock that it is, I would have better used my time improving my application and competing for a position in my desired field thereafter. I’m still angry about it. The medical school that picks an individual trains them and graduates them has a responsibility to that student. I would urge all medical deans to accept this responsibility and guarantee a spot in a residency in the next match (not necessarily in students preferred pick). It makes no sense to spend hundreds of thousands of taxpayer money and not get a practicing physician. Alternatively we could have a second match with only Canadian students. Third option is government could create family medicine spots for unmatched students and ask for 5 years in truly underserved area. Fourth option is towns desperate for Doctors could fund the residency spot in exchange for 5 years service. I’ve really enjoyed your thoughtful comments throughout, and agree with you. Schools need to do a much better job at taking responsibility for unmatched candidates and supporting their students. Furthermore, given that the highest risk factor for going unmatched is going unmatched, it is quite clear that there is an egregious gap in opportunity for these students. I cannot find the logic in why we don’t have rotating internships. That is certainly the expectation set at the beginning of medical school. The CaRMS process is neither objective nor transparent. No other profession requires such a rigid application system. To deny someone continuation in the profession solely based on failing to match is deeply unfair. Career options for MDs outside of clinical medicine make little use of the degree and are no better than could be obtained with an MSc. MDs who build successful careers in other areas typically do so after transitioning from clinical practice, not from the ashes of failed attempts to match into residency. There is enough provincial funding to every Canadian medical graduate to continue into residency. The issue is with distribution and allocation. Greater communication between UGME and PGME departments and the relevant provincial bodies is required to reach a satisfactory solution. Thank you for a fair and balanced recount of a highly complex issue. I find it interesting that you have chosen not to address the question of a medical schools obligation to unmatched candidates. It is well understood that the stigma and psychological distress associated with going unmatched is significant and potentially dangerous as the tragic case described here demonstrates. Medical schools eagerly instruct students in ways to navigate the first and second round matches but then seem to feel little obligation to the unmatched few. If a medical school deemed an individual fit for an MD then surely they consider that individual fit for practice. Such is a basic assumption of the curricular design of our present system. How can you pass all clinical rotations but be unfit for practice? If such is the case, surely it reflects a failure in our assessment system. Perhaps the place of intervention should remain with the home medical school of any unmatched grad. Potentially through a guaranteed spot as has been discussed in the comments – although programs often feel reluctant to be forced to take on the stigmatized unmatched – or through very close collaboration with the student to find an alternative path that may take years to evolve. Maybe that means medical schools should be obligated to provide formal alternative career pathway training for those good enough for an MD but somehow not suited for clinical practice. At the very least, medical schools should be providing significant psychological support over a prolonged period to ensure that no student suffers alone. As has been said many times by the AFMC at national forums on the topic, we simply don’t know where many of these unmatched MDs end up… maybe because to this point we haven’t quite cared enough to take responsibility for them. Thanks for this commentary. Although I didn’t discuss this in the article, I can assure readers that Canadian medical schools do share in the distress of unmatched graduates and continue to provide support as circumstances allow. Tough medicine. Canada in a few short years has gone from undersupply and maldistribution of physicians to oversupply and maldistribution of physicians. We need incentives and supports to promote better distribution, and we need to decrease the net new physicians entering practice in the publicly funded system. Exit strategies for older physicians to divert them into useful and productive non-clinical work, a concomitant reduction in medical school enrollment, an embargo on licencing Canadian medical students trained abroad and foreign trained physicians who are the largest group of physicians who are being licenced by provincial colleges. If we don’t Canada will have a situation like Italy where a medical degree is only a first step on the way to clinical practice. Post graduate trainees compete extremely hard for training positions and are subject to an inferior specialty training pathway of undetermined length. This article has generated a great discussion and creative ideas. I would hate for it to end here. Would any of the commenters/readers here be willing to assist or offer their ideas for a prepared statement to MoH/CaRMS? If so, please reply below. Thanks. I’m a Canadian IMG and I did not match. Although I felt saddened at my outcome this year, I was not disappointed because I had adjusted my expectations to potential match “failure”. I will reapply next year and just keep trying year after year. I knew that in going this route, studying abroad, nothing is a given. It is a tragedy that this individual to whom so much had been promised was so devastated. My deepest condolences to his family and colleagues. I cringe to think what my take on not matching would have been if I had been fortunate enough to enter the Canadian medical schooling system. The case of Robert Chu is tragic. However, keep in mind what the facts are. This is an individual who applied to a highly competitive specialty, failed to match, and then failed to match a second time because other programs rightfully saw that they were a distant second choice compared to his first. He went on a high stakes/high reward route which simply didn’t work in his favor. The overall match rate for CMGs is still 97%, which is basically a guarantee. The overall match rate for IMGs is still 20%, which is basically a lottery. There will always be outliers. I think it would be wrong to speculate on the circumstances of Robert’s application or his decisions. We should, rather, focus on the difficult situation that he and all medical graduates face and work toward towards better processes, or at least clarity and effective support for all involved. I appreciate your attempt at a fair and unbiased discussion of the issue, Dr. Sanfilippo, but I do feel that the issue is being minimized by the system as a whole, and that is concerning. The cIMG match rate is dismal. Yes, the CMG match rates have nearly doubled since 2015, but while 3% CMG go UNmatched…for the cIMG it’s more like 3% who DO match. Of course, simply mentioning the cohort of unmatched cIMG evokes the response that the system is not responsible for those individuals, since the system did not invest in them. However, these cIMGs did not study abroad because they weren’t “good enough” to be in the Canadian UME system. Rather, there simply isn’t enough UME positions either. For the sake of mathematics, if all cIMGs were in fact CMGs, then the unmatch rate would be much, much higher. Simply put, the match rate as quoted, cherry picks CMG applicants as the denominator, NOT the total number of applicants as it should be the case. Calculating the match rate based on an incomplete denominator is disingenuous at best. The number of Canadians with an academic MD who do not match into a residency is NOT 3% annually; by your numbers alone, it’s more like 50%. 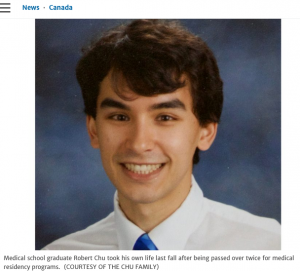 That makes the tragedy of Dr. Robert Chu only more heart-breaking. How many more tragedies have happened in the other 2500 that did not make it to the news? How many other voiceless young, passionate minds have we lost? The point of this, is not to say that the cIMGs also need attention (although, they do). The point is that the tone of this essay, suggests that the system simply has no insight into the magnitude of the problem. Only 3%? Just apply the MD training to another career? These are suggestions made by an institution from their perch in their Ivory Tower. I VERY much appreciate the second last paragraph of this essay. Emphatically, the status quo should NOT be accepted. And given the highly specialized nature of UME, there SHOULD be mechanisms to prepare students for alternative careers. But, as mentioned, this problem is much, much, much more grave than 3%. Thanks for this perspective. The 3% figure relates to graduates of Canadian medical schools, which I think is clear in the article, but perhaps I should have been more specific in the phrase you quote. This is not intended to minimize the impact on Canadian IMGs or suggest they’re not “worthy”. The point of the article, as you rightly point out in your final statement, was to draw attention to the personal and educational impact of this situation, and to suggest we need to address some key and very difficult issues. As many respondents have indicated, there are no easy decisions or solutions, but all candidates (and medical schools) at least deserve clarity as to their circumstances and prospects. I do not agree that cIMG should be taken into consideration when presenting the match rate percentage. There is a reason why there is a limited number of spots in undergraduate medical programs.. our public system also has a limited number of positions for practicing physicians. When students chose to undertake their undergraduate medical studies abroad, they know that it will be harder to return to Canada. It is easier to get into foreign programs than it is to get into Canadian medical schools. Why should those students who choose to take a shortcut by going to a foreign program be guaranteed a fast track back into the Canadian system when there are students who try multiple times before being accepted at a Canadian medical school? If there is a significant chance of students going through medical school an taking on $200,000 in debt and end up without a residency or job, then this will deter lower socioeconomic class students from entering medical school. The only students who can take on this kind of risk are those from well off families. This also works at the carms level. The only med students that can virtually guarantee a highly competitive specialty are those with personal (ie. family) connections. If demonstrating interest in a highly competitive specialty automatically makes a student a pariah for less competitive specialties in both the first and subsequent cycles of carms, then this will deter students who are not well-connected (or alternatively, wealthy enough that they can take on the risk of not matching). I do not believe that preferentially having well-connected, wealthy students enter medical school and enter highly competitive specialties is a desirable outcome. As others have mentioned above, the 2-3% of students who go unmatched are not necessarily the “bottom 2-3%” either academically, socially, or in terms of clinical potential. Being unmatched is due to a range of factors, some of which are beyond a student’s control, including elective scheduling, whether a supportive staff happens to be on the week of the student’s elective, and how many other people happen to also be interested the year the student applies. I don’t have stats on this, but from what I have observed, the chance of being unmatched is highest not for those who are below average academically but for those who choose competitive specialties and fail to obtain their desired competitive specialty. Having read all of the comments, I feel tremendous sadness for CMG’s who did not match. However at the same time IMG’s – Canadian students studying abroad. What appears to be missed here is the number of spots in French speaking Canada that went unmatched. The spots in English speaking Canada were taken by French speaking CMG’s not IMG’s. The spots in French speaking provinces remain unmatched. Selecting electives that reflect the graduate’s true desire is important. While a risk, it also shows determination and dedication to that area of specialty. Applying broadly doesn’t seem to be a good strategy. The psychological impact of not matching is not comprehensible to anyone outside of the field. Everything hinges on the match.